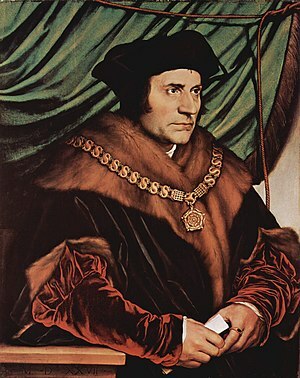 St. Thomas More (1478-1535) was an English statesman, social philosopher and saint born in London. In literary circles he is known as Sir Thomas More. More was a lawyer and entered a Carthusian monastery for four years. He became Henry VIII’s Master of Requests (1514), Treasurer of the Exchequer (1521) and Chancellor of the Duchy of Lancaster (1525). In 1529 he was Lord Chancellor but resigned in 1532 when Henry broke with the Church in Rome, declaring himself head of the Church of England. Although More had been Henry’s personal friend, his refusal to endorse Henry’s political, religious and personal choices led to a grisly fate. More was imprisoned in the rat-infested Tower of London for over a year and beheaded by the axe for High Treason in 1535, much to the dismay of his wife and children. A leading humanist scholar, More held company with the likes of Erasmus and leveled an attack against Luther‘s reformation movement. His literary works include the popular if, at the time, much misunderstood Utopia (1516), which Erasmus helped him to edit. More also set an example for other nobles by ensuring that his first wife (who died young) and daughters were well educated. An excellent depiction of More can be found in the film, A Man For All Seasons (1966). More was canonized in 1935, and given the feast day of July 9th.